You must thank the person who nominated you and link back to their blog. You must list three ways in which you like to help people through your blog. You may pass it on to however many other bloggers you’d like – no limits. Many, many thanks to Marty for this lovely award. I hope you’ll take a second to click here and drop in on Marty and his fur siblings–one kitty and three puppy dogs–at MusingsbyMartyManx. Now for three ways that I like to help people through my blog. I like to make people (and assorted animal readers) smile. If you’re smiling right now–and I truly hope you are–then I’ve done my job. 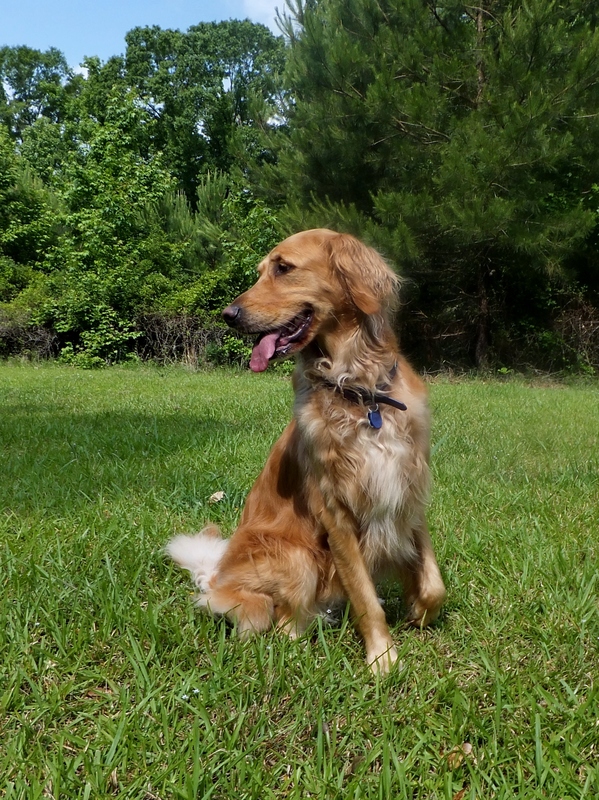 From time to time, I share information about living with hip and elbow dysplasia. (You can click here, here, and here to read the posts I’ve written, with a little help from my blogging assistant/human mommy.) 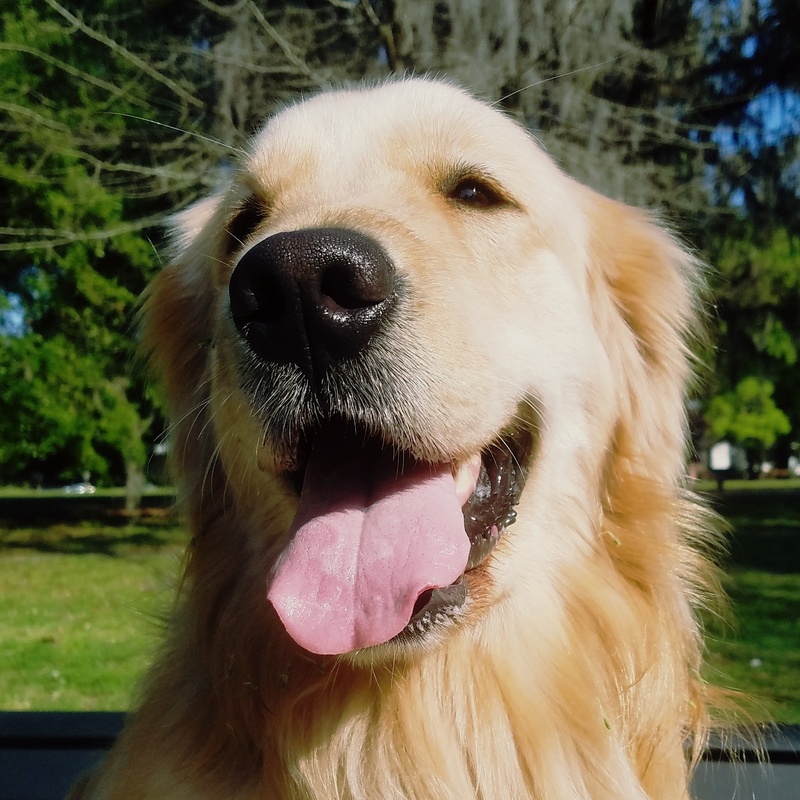 I hope that the information I share will be useful to other dogs who are diagnosed with dysplasia and that it will help to ease the worries of their humans. 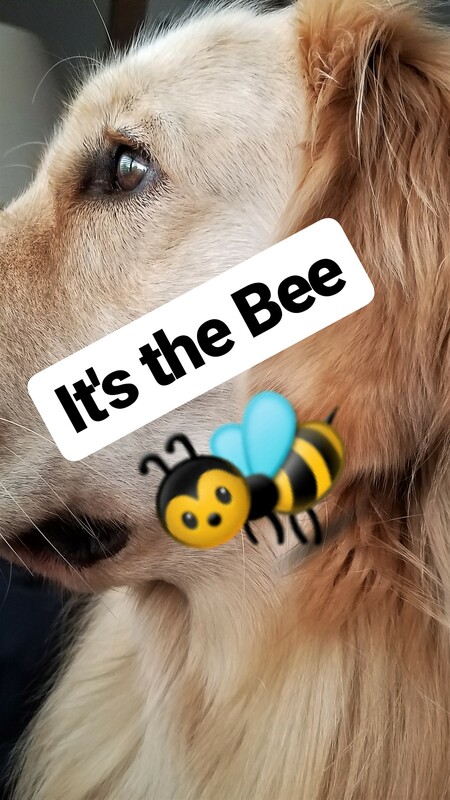 I like to give humans ideas for fun activities they can do with their precious pets (or should that be fun activities that pets can do with their precious humans? ), including baking healthy treats, going out to eat, hitting the road for overnight adventures, or simply enjoying a fun walk on a beautiful day. I’m sharing this award with a few of my blogging friends who also happen to be Instagram friends. Twice the fun! 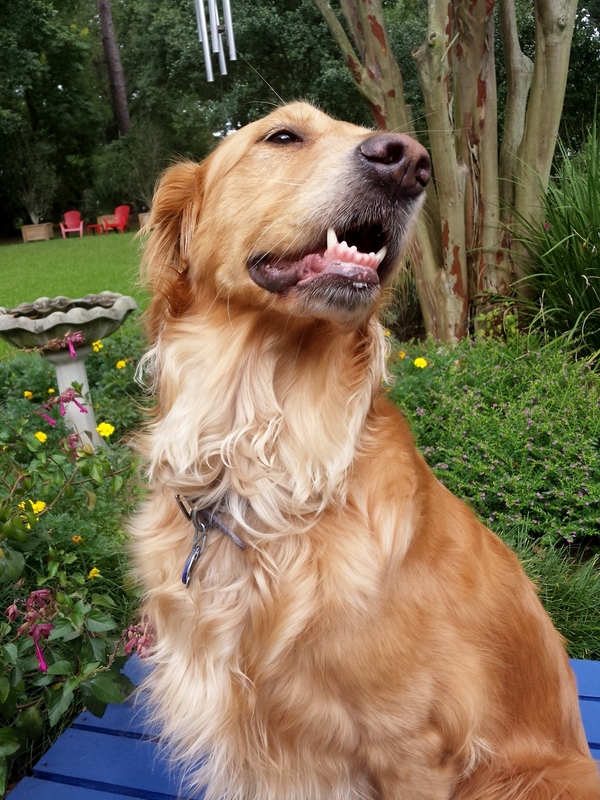 Barking from the Bayou (on IG @mkclinton)–Fellow Louisiana resident and LSU football fan M.K. Clinton, along with her Basset Hound Bentley and granddog Pierre the Westie, deliver product reviews, dog tips, and a whole lot of laughs. BearHUGs Forever (on IG @rosyrue)–Toy Poodle Rosy is one lucky dog: She lives in beautiful San Diego and gets to visit the beach on a regular basis; she has a fabulous wardrobe; and she has her very own dog, Annie the Cocker Spaniel. 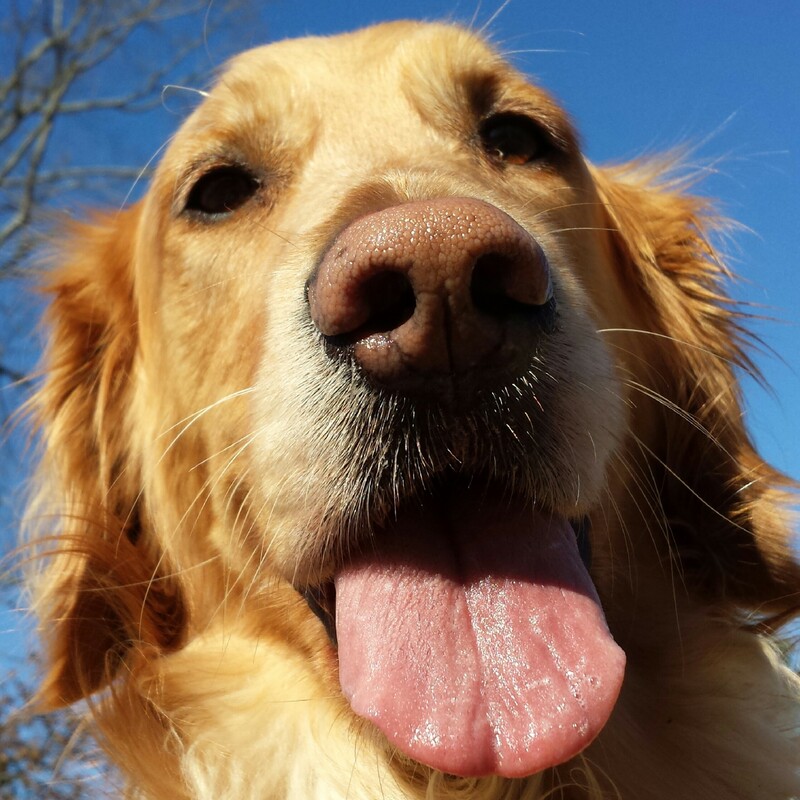 Miley’s Daily Scoop (on IG @mileysdailyscoop)–What could possibly be more fun than one Golden Retriever? How about two Golden Retrievers (Miley and Bruin) and a Golden Lab (Maggie). And then, of course, there’s beautiful Belle the cat. Before I go, I have two more friends to thank: Thank you to Lorian at dogdaz for giving me the Liebster Award a couple of months ago. (Wow, do you realize that it’s August and my human mommy/blogging assistant is just getting around to thanking my friends for awards that they presented to me in May and June. Seriously, I may have to dock her pay.) You can click here for my Liebster Award post from a couple of years ago . . . and then you’ll find out if I’ve ever been in a bar brawl. 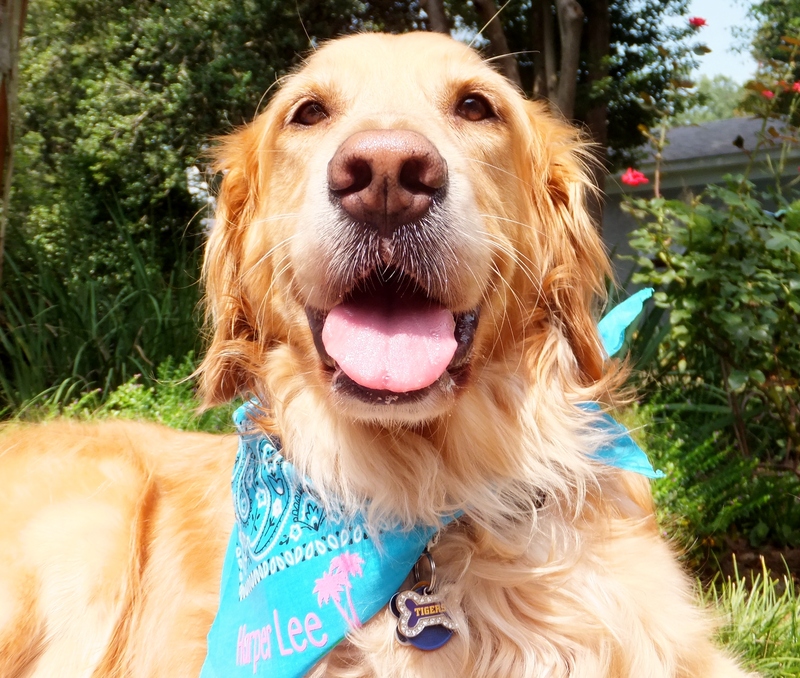 And have you noticed the beautiful bandanas I’m wearing in all of my pictures? 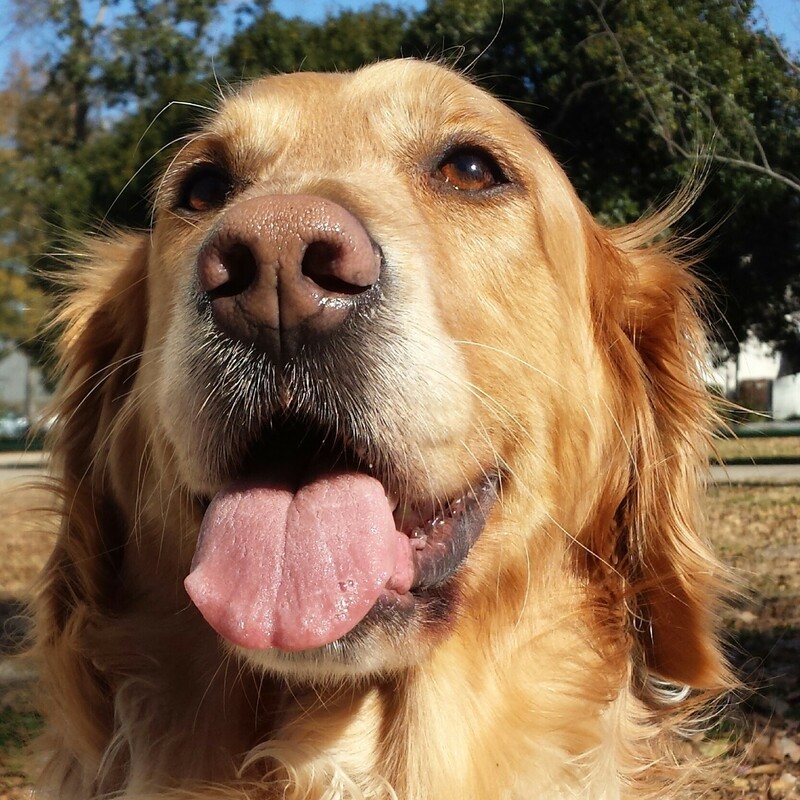 They’re a gift from my Instagram friend @johnanng, human mother to three rowdy retrievers living in Florida. Thank you @johnanng! Looks like I’m going to need more closet space. What girl doesn’t like shiny things: diamonds, pretty shoes, new cars, a bright smile? Well, this Golden girl is no different, and I recently received the best shiny thing ever from not one but two very bright and shiny blogs. Acknowledge that blogger on your blog, and link back. Share seven random things about yourself. Nominate up to 15 bloggers for the Shine On award, provide a link to their blog in your post, and notify them on their blog. 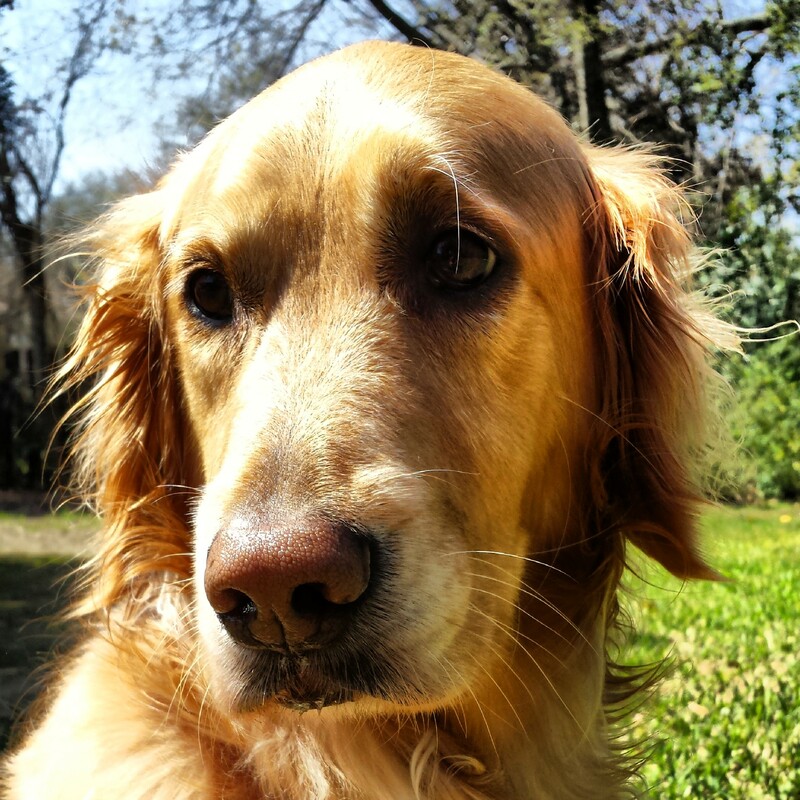 To Monty and Harlow: thank you, thank you, thank you! 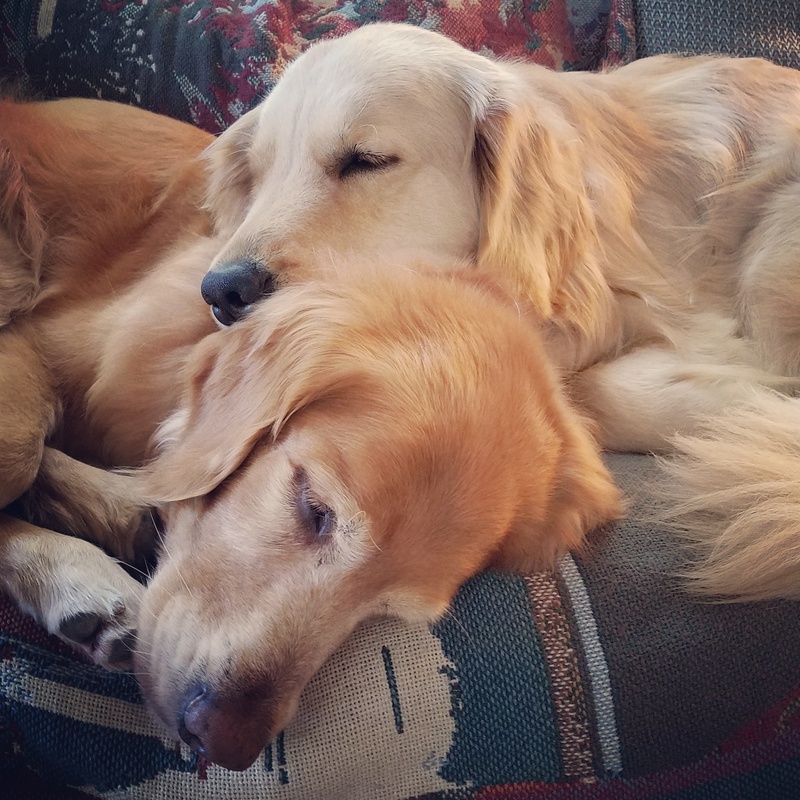 Handsome Monty and beautiful Harlow are two Golden Retriever rescues living the good life in Arizona with their loving human mom and dad. 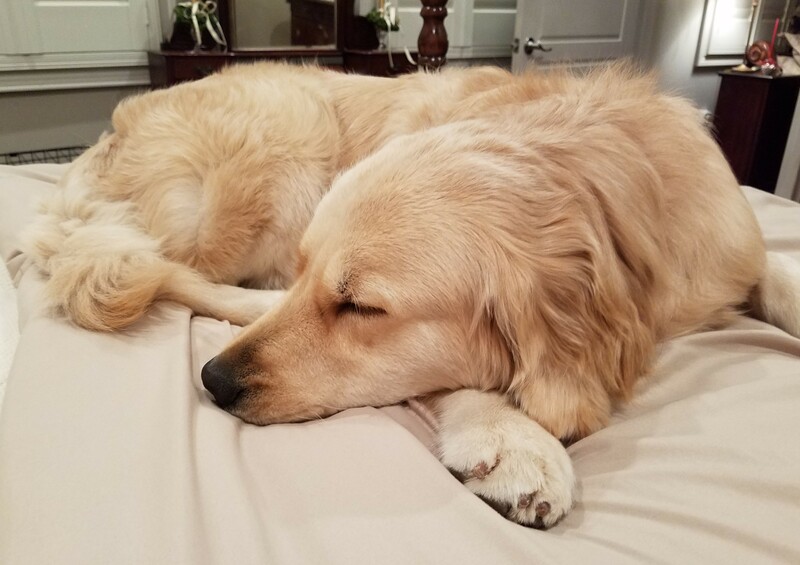 You can click here to meet them and read more about their adventures and all they do to support Arizona Golden Retriever Connection (AZGRC). And to Bernie: thank you, thank you, thank you! Bernie is a cute French Bulldog who celebrated his first birthday this past December. He lives in North Devon, England, with his human mom and dad and a new little human brother. Click here to read more about Bernie and join him on one of his beautiful beach visits. So, I’ve completed #1 and #2 under the rules. That must mean that it’s time to move on to #3–seven random things about me. I start every day with a perimeter search of my yard. I’m afraid of bugs that buzz. I won’t walk over manhole covers. I have to be kissed before I’ll eat. I deliver a big burp to my human daddy every morning after breakfast. Black and White Sunday is my favorite blogging day. 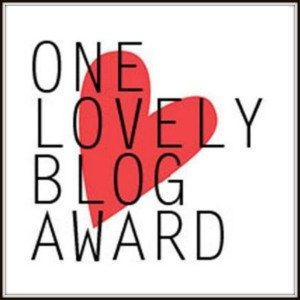 And finally #4–nominating my blogging friends for their very own Shine On award. If you haven’t met these wonderful bloggers, I hope you’ll stop by for a visit. 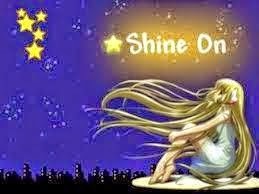 And to my nominees, if you’ve received the Shine On award before, you can now consider yourself to be super shiny! Lagniappe (pronounced lann-yapp) is a word that people in South Louisiana use to mean something extra. It’s like getting a really good ice cream sundae that already has chocolate and whipped cream and nuts and a cherry, and then someone adds sprinkles to the top. The sprinkles are lagniappe. 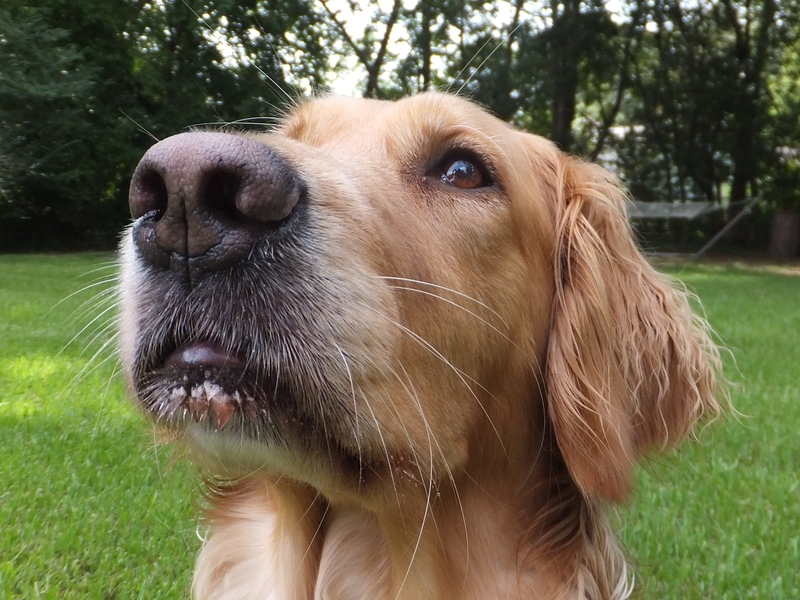 Or here’s an example that all my canine friends will understand: It’s like when your human takes out a milk bone and you get all excited because you think nothing could possibly be any better than a milk bone, and then your human puts just a bit of peanut butter on that milk bone before handing it to you. The peanut butter is lagniappe. So now it is my pleasure to present to you a little lagniappe for you day. Enjoy! You may recall that last week I wrote about my sweet friend Ku and his new book, Kuruk: The Little Bear That Could. I said that I would have a drawing for a copy of Ku’s book from all the people (and animals) who commented on that post. Well I did. I had never actually done a drawing before, so I did a little Googling to find out how it’s done. I found a great blog post by i’m erika jurney + this is my blog that had all the answers I needed (leave it to a blogger to have all the answers!). So, on the first random drawing, the winner was Commenter Number 7–Ku. I figured he didn’t need to have a copy of his own book, so I tried again, and this time the winner was Commenter Number 11, Jan from Wag ‘n Woof Pets. I put a copy of the book in the mail yesterday (well, technically my human mommy went to the post office because I am not allowed inside there), so Jan should have Ku’s book in time for some nice weekend reading. 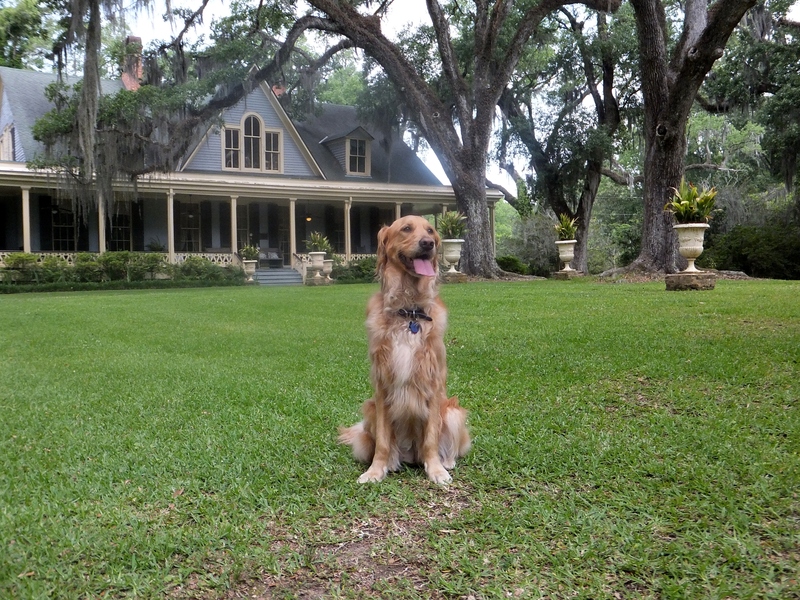 Congratulations on your lagniappe, Jan, and enjoy! Well, if Oprah Winfrey can do it, why can’t I? 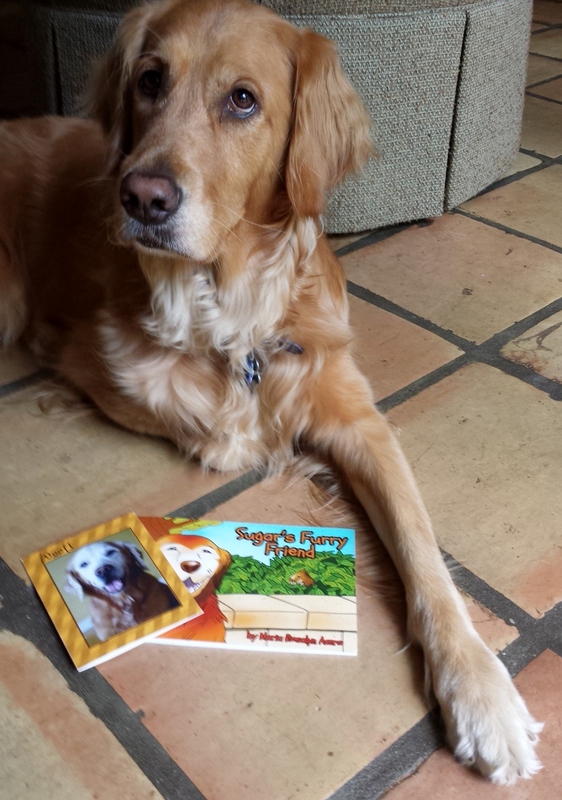 The next book that I would like to recommend to you and any young children in your life is Sugar the Golden Retriever’s Sugar’s Furry Friend, which is all about Sugar and her little backyard chipmunk friend. 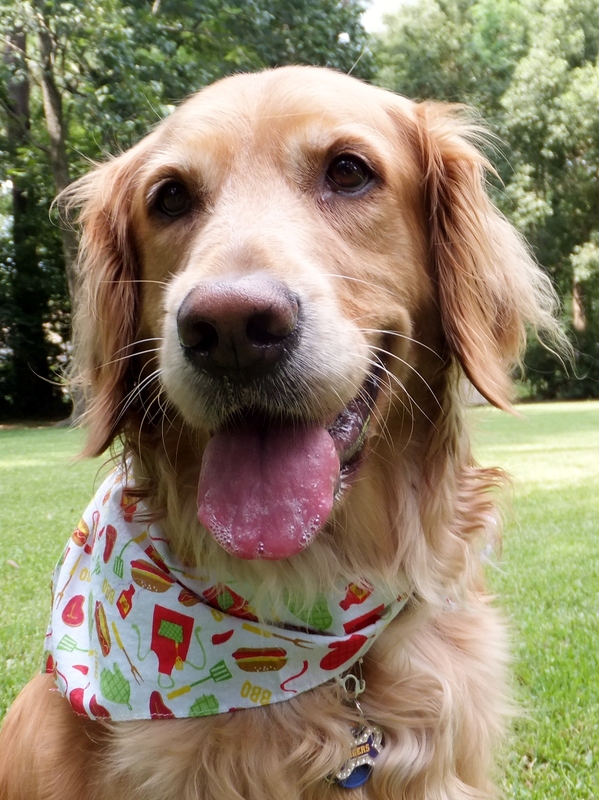 Sugar celebrated her 12th BarkDay last month. She had her own random drawing from everyone who joined in on her barkday blog hop, and I won her book! In addition to sending her book, Sugar sent the sweetest note on her very own stationery (I’m still waiting for my mommy to get my stationery) and a See Beautiful dog tag. 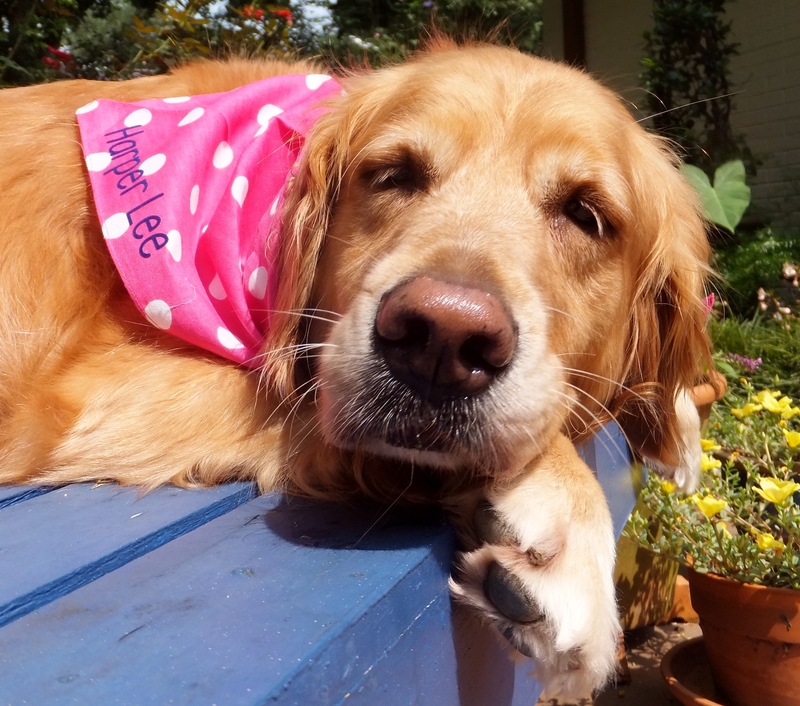 You can click here to read all about See Beautiful and to learn more about how to order Sugar’s book. Thanks for the lagniappe, Sugar! 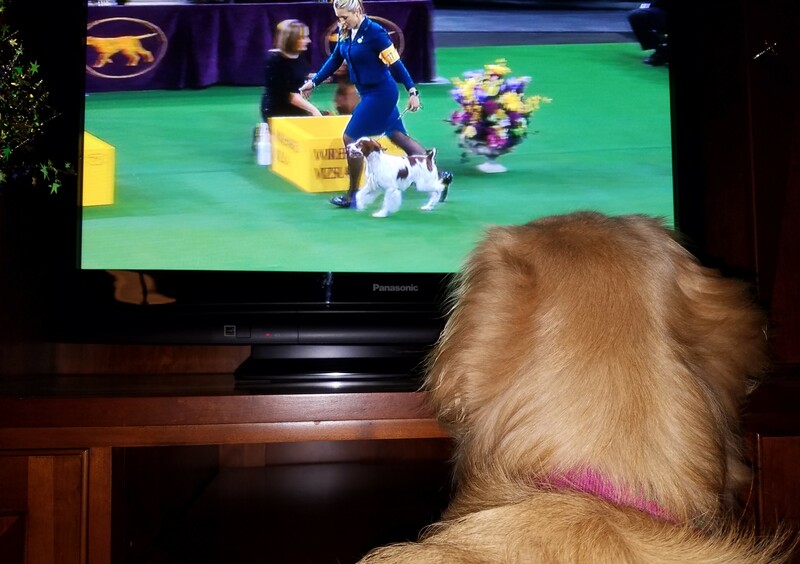 I think my humans are starting to get a little jealous. My mailman Mr. Leroy brings the best packages for me, and they just keep getting bills. Sorry, humans. 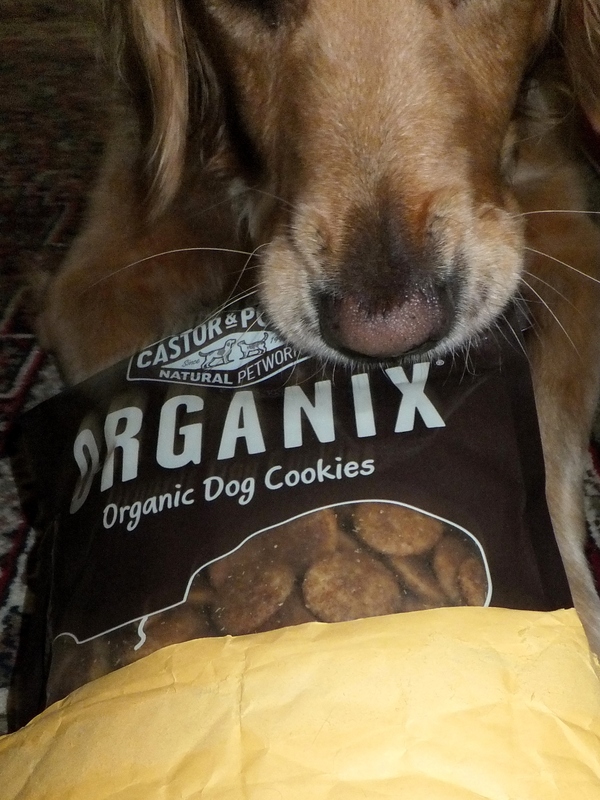 Last week I received some super yummy treats from my friends at Paws It On. 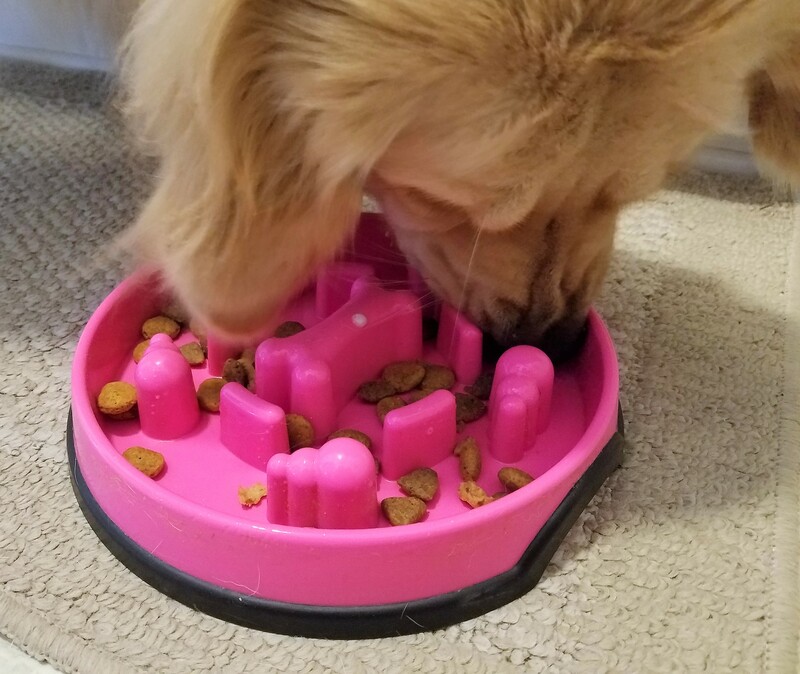 Click here to visit the Paws It On blog, see more pictures of me enjoying my treats, and find out how you can nominate a special friend for a Paws It On treat. 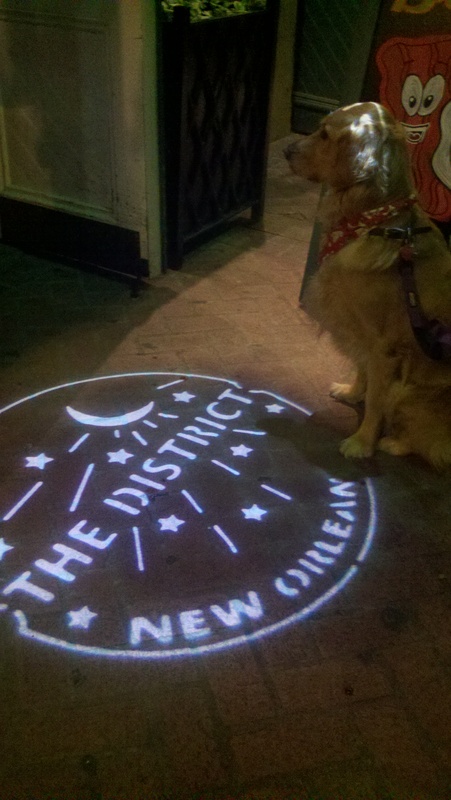 Thanks for the tasty lagniappe, Paws It On! Last month, I received the Bouquet of Three Award from my cute little piggy friend Bacon at Pig Love. Thank you, Bacon, for the beautiful award, which I presented to my friend Maryanne Mistretta on her birthday . . . a bouquet of birthday flowers in the form of an award. And a big thank you to Peppino at Pippy Monster for the Super Sweet Blogging Award and the Versatile Blogger Award. I hope that you’ll click here to visit Pippy and that you’ll also visit my Super Sweet Blogging Award and Versatile Blogger Award nominees. Being rewarded for something that you love to do. Does anything say lagniappe more than that? I think not! 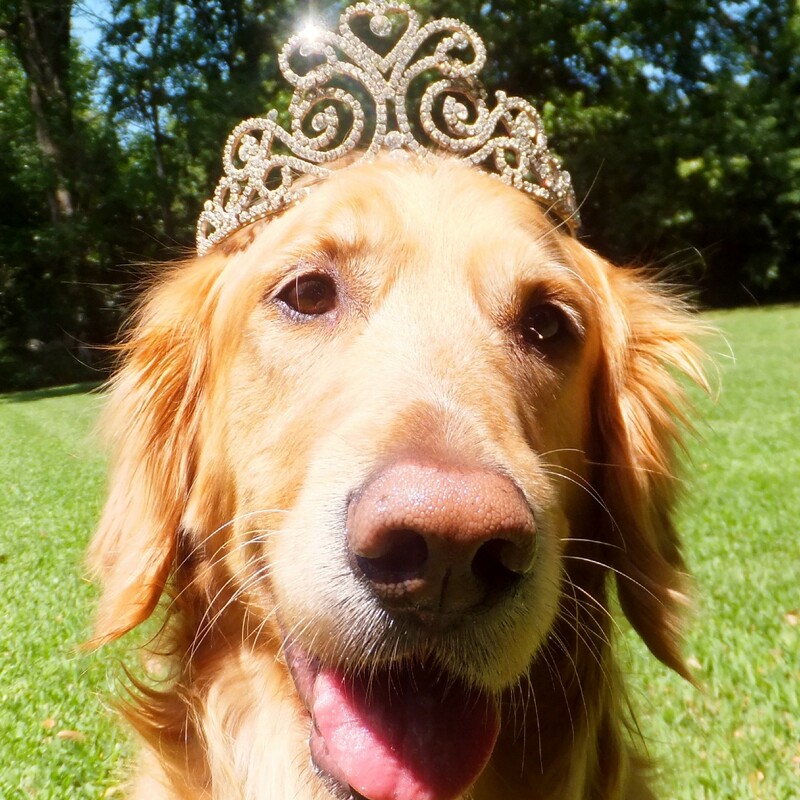 Happy Birthday to my blogging friend Miss Maryanne! I hope that you have had a wonderful day and that all of your wishes come true. In celebration of your special day, I present to you the Bouquet of Three Award. I received the award from Bacon at Pig Love, and I am passing it on to you. There are rules, but because it’s your special day I give you permission to ignore the rules. Think of it as a beautiful bouquet of flowers (bloggy style)! I hope everyone will click here to visit Maryanne Mistretta and wish her the happiest of happy birthdays! Late last week, my human mommy went to the store and came home with the biggest, strangest, heaviest ball I had ever seen. I tried and tried to pick it up and run with it, but that strange ball was just too big and too heavy . 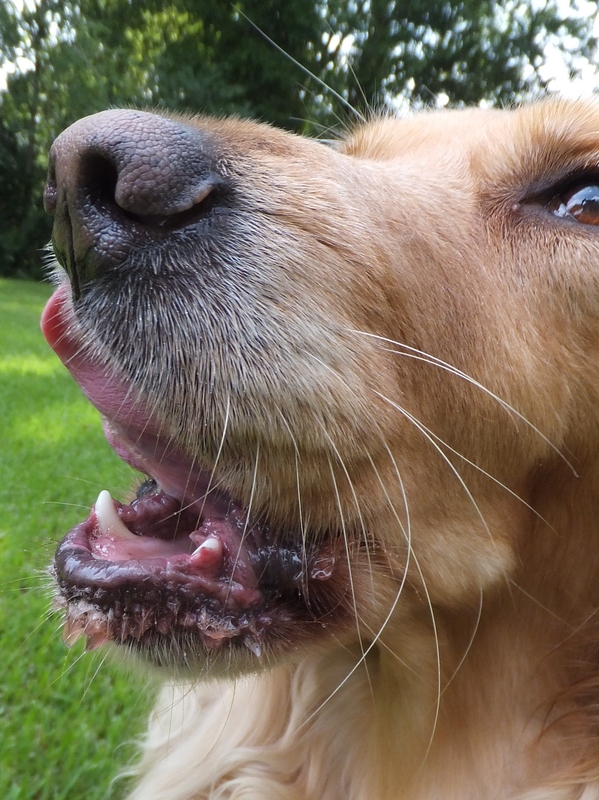 . . even for my huge Golden Retriever mouth. Then my human daddy took a giant knife and cut that odd ball right in half. I will tell you that at first I was more than a little shocked and somewhat frightened. Was it bleeding? Had Daddy killed it? 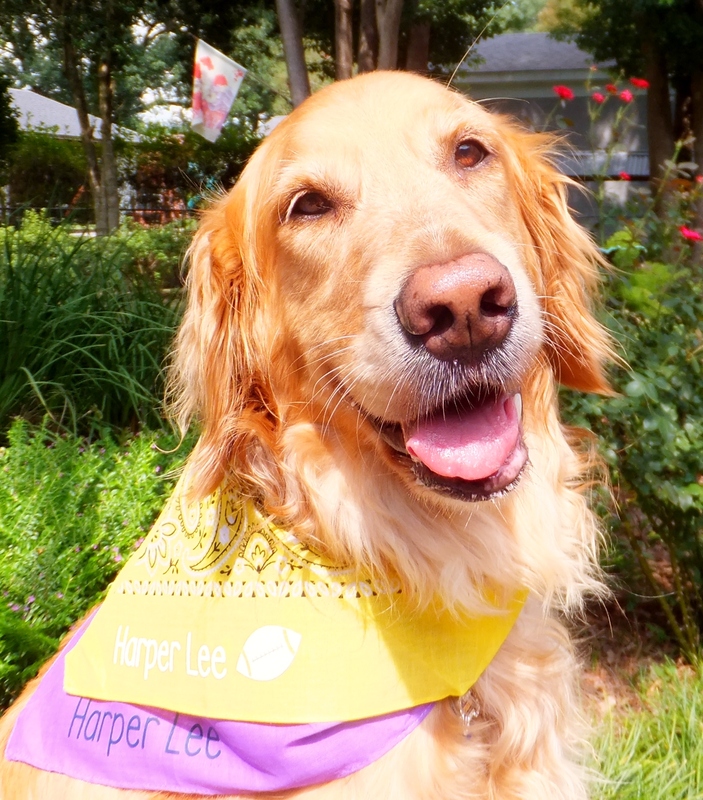 But my humans kept saying, “Taste it, Harper Lee. 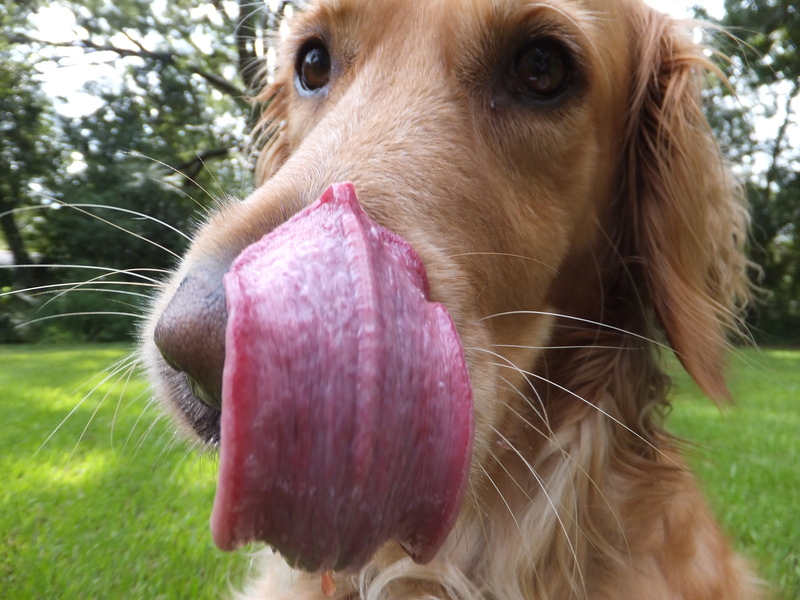 Taste it!” And so I did, because I am obedient. 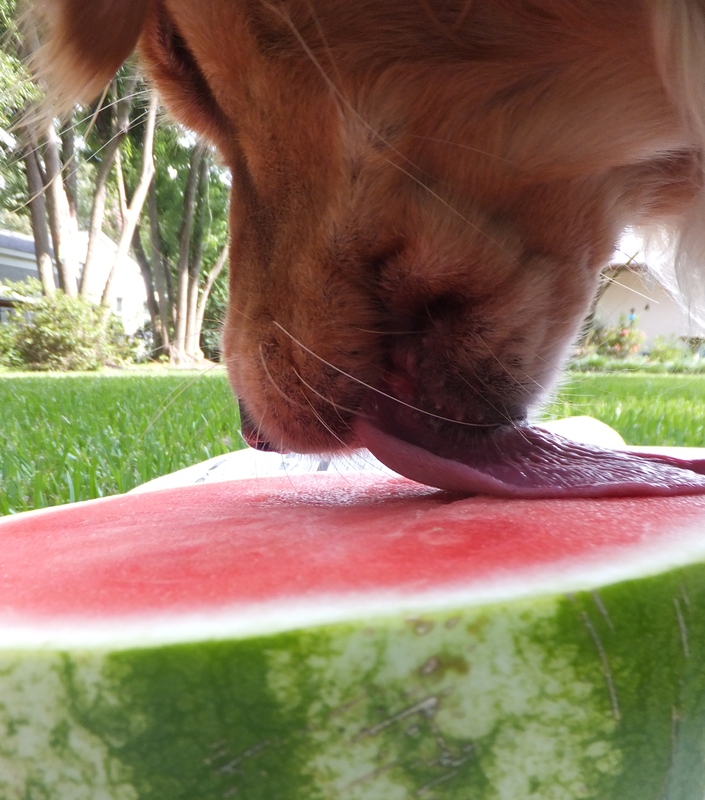 At first lick I knew just exactly what I was tasting: Watermelon! 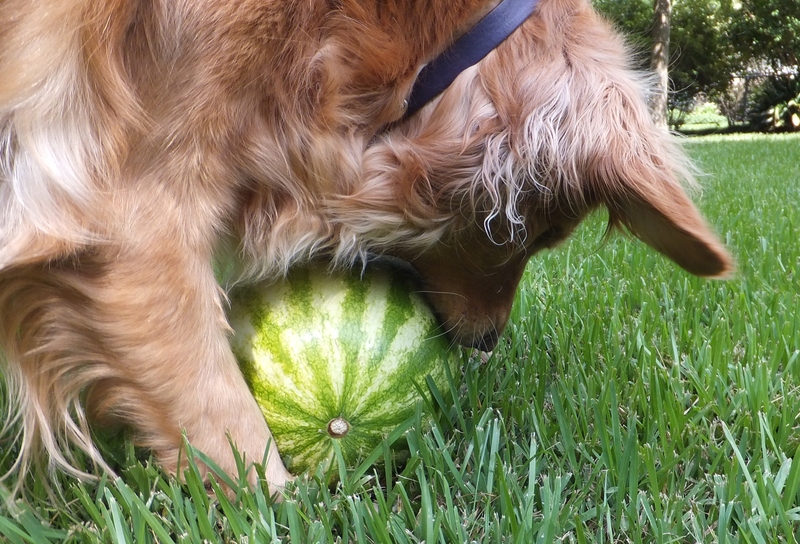 This was not my first watermelon experience. 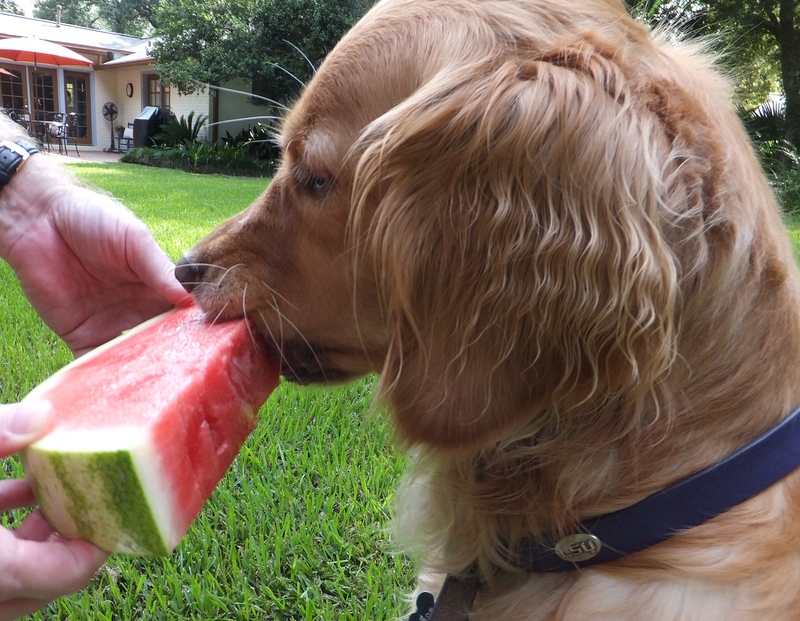 Earlier this summer, when I visited my human grandparents in Texas, I had my first taste of watermelon; but that watermelon came pre-cut in a little plastic container. This watermelon was the real deal. As Daddy held my first real slice of watermelon, I started eating . . .
. . . and then I really got into it. I ate a lot of watermelon. I think it may be the very best thing I have ever eaten. It was certainly one of the messiest things I’ve ever eaten. 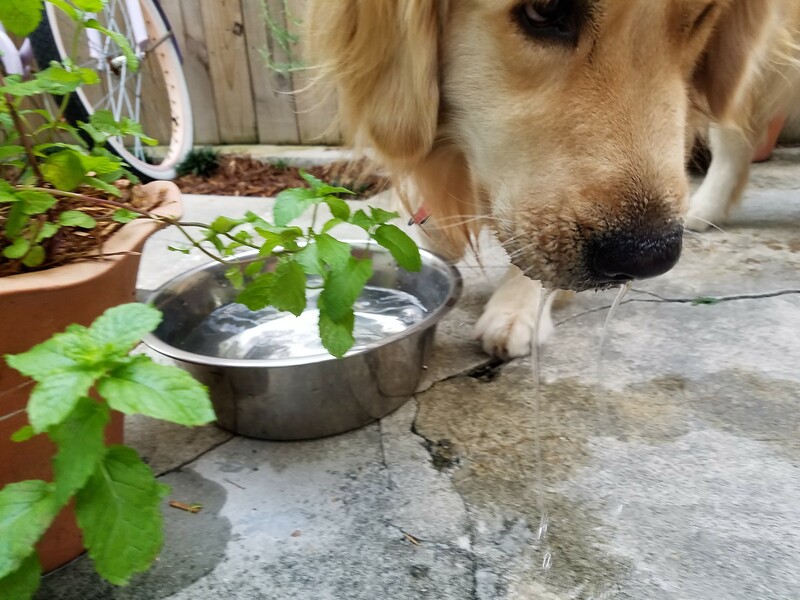 Watermelon was all over my mouth, so I licked . . .
. . . and then I really licked . . .
. . . but that watermelon was still there, and so I asked Daddy very nicely if he would please wipe my mouth with some paper towels, which he did. 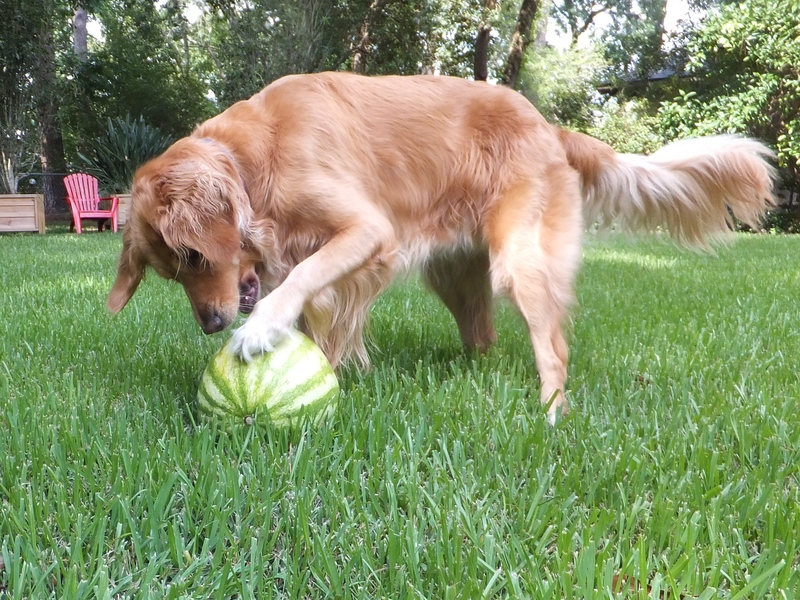 Now, I don’t want you to think that my humans missed out on all the weekend watermelon fun. Trust me, they didn’t. They enjoyed their watermelon in the form of an adult beverage. 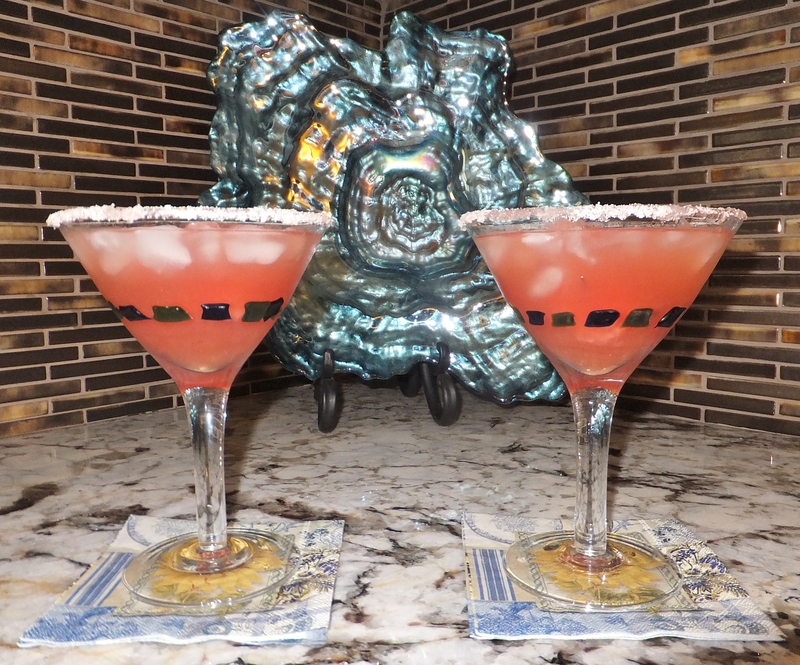 Watermelon margaritas, anyone? 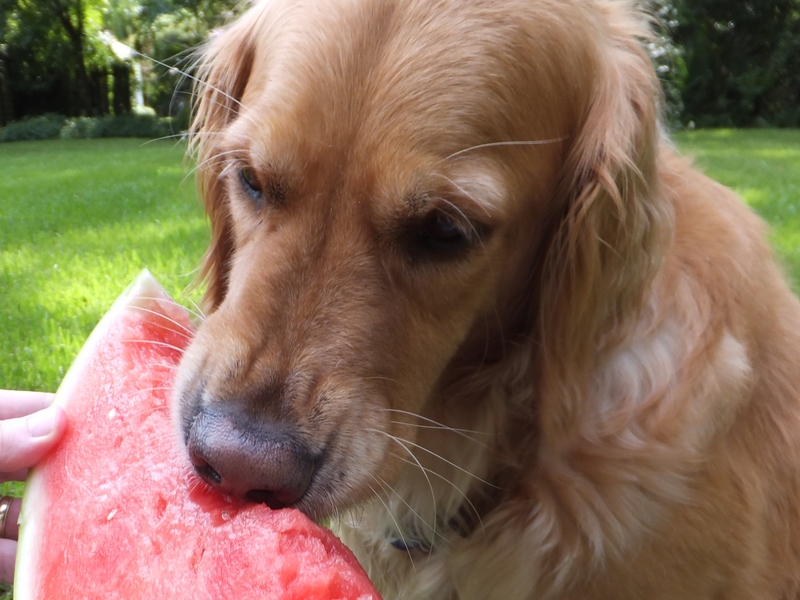 When Mommy planned our watermelon experience for Saturday, August 3, she had absolutely no idea that we would actually be celebrating National Watermelon Day in the most appropriate way. Leave it to our little friend Bacon of Pig Love to keep us informed about the most important “holidays.” You can click here to read all about Bacon’s fun with watermelon. You’ll definitely want to see his photos! And speaking of Bacon, last week that cute little piggy presented me with the Loyal Reader Award. Thank you so much, Bacon. 1. 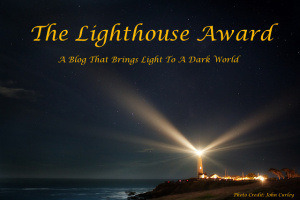 Display this award on your blog. – Done! 2. Thank the person who sent it to you. – Thank you, Bacon! 3. Answer a question of the author’s choosing. – About to be done! 4. Pass the award along to everyone you consider a loyal reader. – As Bacon said, this is the hard part. I appreciate all of my readers, whether you’ve followed me from the beginning or found me recently. I appreciate my friends who read every single post, and I appreciate readers who have been drawn to just one or two posts. I appreciate my readers who make comments, those who click the “Like” button, and those who take a look and then move along. Many, many thanks to all of you! The Question: If I am a tree, will I become a book or furniture? My Answer: My answer to this one has to be book, and not just any book. If I am a tree, I will become To Kill a Mockingbird by the human Harper Lee. And finally, I present a very special Loyal Reader Award to each and every one of my non-blogging readers. It’s one thing for fellow bloggers to support each other. It is another thing entirely for you to subscribe to and visit a blog. Thank you! If you could be a bird or a fish, which would you be and why? I cannot wait to read your answers!